This was our first Halloween together as a couple. We thought long and hard because we wanted something unique, fun and creative. 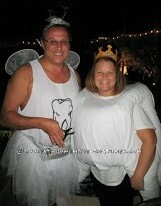 We came upon a The Tooth and Tooth Fairy couple costume that we thought would cover the fun part. As we were discussing this idea, my boyfriend said that he should be the Tooth Fairy instead of me. This was the unique and creative component that was missing. It was all coming together nicely. 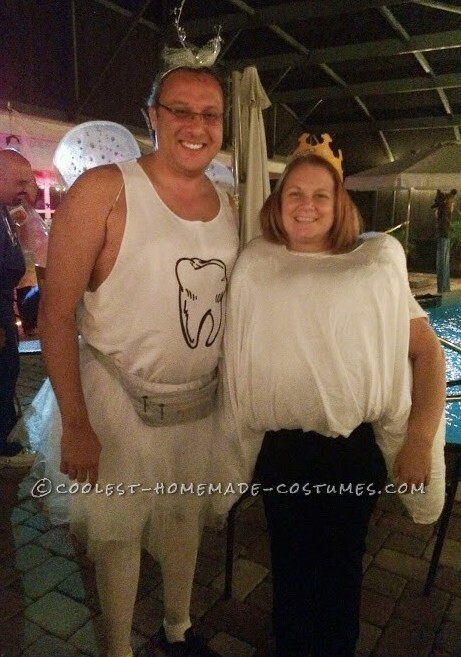 The Tooth costume was designed with two regular size pillows in the front and two king size pillows for the sides. The sides were constructed with the cut in the middle to make the roots of The Tooth and make it look more authentic. The holes for the arms were cut out of the side pillows also. All the pillows were sewn together. A sheet was used to cover everything up and sewn around the pillows. A crown was obtained from the local Burger King. The Tooth with a crown was born! My boyfriend pieced his Tooth Fairy costume together and made sure that his tights and tutu fit just right. Luckily for everyone at the party, he wore shorts under the tutu. He decided to put a silver fanny pack around his waist. In this fanny pack, he included a pair of pliers, a set of dentures and tons of fake teeth (he acquired these from his father who is a dental technician). We also made up fake dollar bills with our picture in the middle to hand out at the party. The Tooth Fairy came with lots of props. The night started out with me laughing hysterically when I saw him for the very first time. His son and my son were mortified that he was wearing that outfit out of the house. Everyone told me I looked adorable and they all just cracked up when they saw him. We got lots of great compliments at the party and on Facebook when we posted our pictures. My boyfriend said he loved my costume but it was hard to put his arm around The Tooth. I told him that my outfit had a place to lay his head on all four sides of me. He’s still getting glitter off of his car left from his sparkly wings. We even went to Wal-Mart after the party and got even more comments. It was a couple costume that was exactly what we wanted and we have lots of great memories from our first Halloween together! Homemade costume idea posted by Juliet A.